You normally wouldn't stay up late on a Friday night for Brigham Young football, but if you were ever going to, it would have been this season to watch quarterback Taysom Hill. Hill had five rushing touchdowns and five passing touchdowns in the Cougars' first four games of this year, garnering some serious Heisman hype. 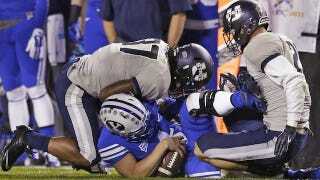 But Hill's season, and likely BYU's, came crashing down Friday night. Late in the second quarter of the Cougars' game against Utah State, Hill broke his leg after a tackle by Aggies safety Brian Suite. The star signal-caller will undergo surgery today that should keep him sidelined for three to four months. Hill's replacement Friday, Christian Stewart, completed only 10-of-29 passes and threw three interceptions. BYU, who entered the game ranked No. 18, didn't fare much better on defense, allowing Aggies backup Darrell Garretson to complete 76 percent of his passes and three touchdowns through the air. BYU had potential for an undefeated season, and of course a big-time bowl bid, with Hill at the helm. But his loss and the team's loss last night robs the Cougars of that dream. It's possibly BYU rallies to salvage its season after dealing with the shock of last night, but it won't be the same without Hill.